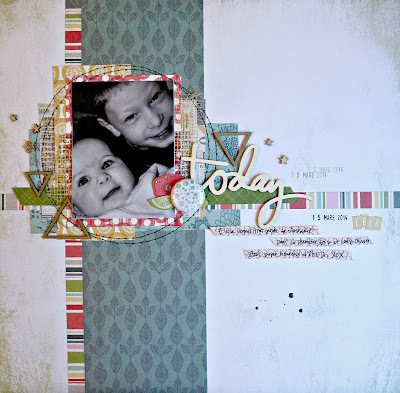 SO love how SOS is inspiring me to dig deep in my stash and use scrappy goodies I've been holding onto for years! Such is the case with Basic Grey's What's Up? collection. As soon as I saw air balloons in the first list of items to use on this layout, I started looking for it. I knew there was this BG collection that had some in it. And ta-da! There it was. I used tons of it for this layout - patterned papers (I fussy-cut that air ballon - it's actually just half of a balloon, but tucked behind my paper layers, it still does the trick! ), alphas, and chipboard stickers. I also layered a piece of BG's Wisteria collection as well as one from BG's RSVP collection. They matched so perfectly! YAY! Finally, I added a few buttons (item from list 2) as embellishments on the air balloon, Stampin' Up cardstock for my journalling and some of their vellum behind my photo, a Freckled Fawn title wood veneer piece, a few splats of Tattered Angels Glimmer Glaze (my journalling is actually hiding a few splatting mishaps! ), a run of the mill paper clip, and yes, of course, some hand-stitching using a Crafter's Workshop stitching template and some DMC floss. Oh! And my item for list 3 is the piece of patterned paper with chevrons on it. Photo by Jocelyne Roy, a scrappy friend who's been babysitting my sweet Éloïse for the past two years. Love these pics she takes of our girl while we're working. Merci, Jocelyne! Hope you'll dig deep in your own stash to find everything you need to create something for this challenge. 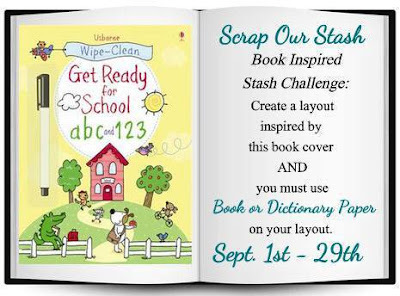 And if you upload your own layout inspired by this challenge over on the SOS blog, you'll get a chance to win some sweet, scrappy loot! For more information about this challenge, please hop along right over here. Now, before you ask where are the JustNick die-cuts, they are there, I promise. As of late, many layouts created using digital die-cuts showcase the die-cut itself. And they are absolutely beautiful. However, in my case, I had already created this layout for this reveal before I found out that I had to add some JustNick elements to it. I was stumped. I really liked the original version. I still wanted to reveal it via Stuck?! Sketches, so... I brought it back to the basics. What shapes were predominantly found on my layout? 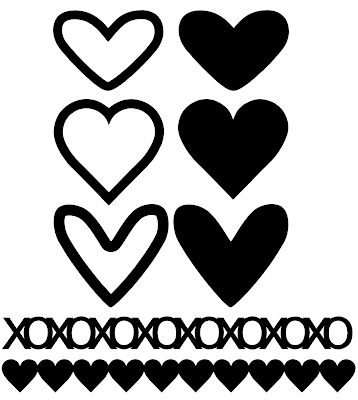 Circles, rectangles, and... hearts! With this in mind, I went in my JustNick collection of digital die-cuts and found the Hearts file. It was PERFECT! I cut a few hearts out of textured vellum, dry-embossed them and layered them in my patterned paper cluster. I may have liked my layout a lot before, but now, I L-O-V-E it! YAY! So what else did I use for this layout? Went to my My Mind's Eye stash this time around (gotta give Basic Grey a break sometime... Hee!Hee!) and took out the Cut & Paste Adorbs collection. Used some of its patterned papers (both the 12X12 and the 6X6) and buttons. I also a few Basic Grey buttons and alphas (gotta put some BG somewhere... Hee!Hee! ), wood veneer hearts (I believe from Maya Road, but I may be mistaken), Fancy Pants and MME title stickers, Crate Paper chipboard stickers, stamping using one of my all-time favourite sets ever by Prima Marketing and some Versafine inkm ink splats using some Tattered Angels Glimmer Glaze, pieces of The Paper Company's textured vellum for the hearts I cut using the JustNick Hearts file, dry-embossing using a Tim Holtz folder with my good ol' Cuttlebug, and hand-stitching using a Crafter's Workshop stitching template with some DMC floss. And yes, you see two dates on there - one for each photo. Mm-mmm, that's right. I scrapped a layout with photos taken on different days. But do they ever show how my husband and our sweet Éloïse share such an amazing relationship. And that's what this layout is all about - just being happy with those around us. Please link up your layouts over in the Stuck?! Sketches sidebar right here by September 29, 2016, at midnight EST to be in the running for one of these prizes! Hello, hello! The celebrating is still going on over at Stuck?! Sketches as it celebrates its third anniversary. YAY! Please link up your layouts over in the Stuck?! Sketches sidebar right here by September 29, 2016, at midnight EST to be in the running for one of our prizes! All prizes will be drawn randomly using Random.org to pick a number. Inspired by the outdoor and back-to-school theme, I opted for a fall layout featuring my two munchkins having fun in the leaves last year. 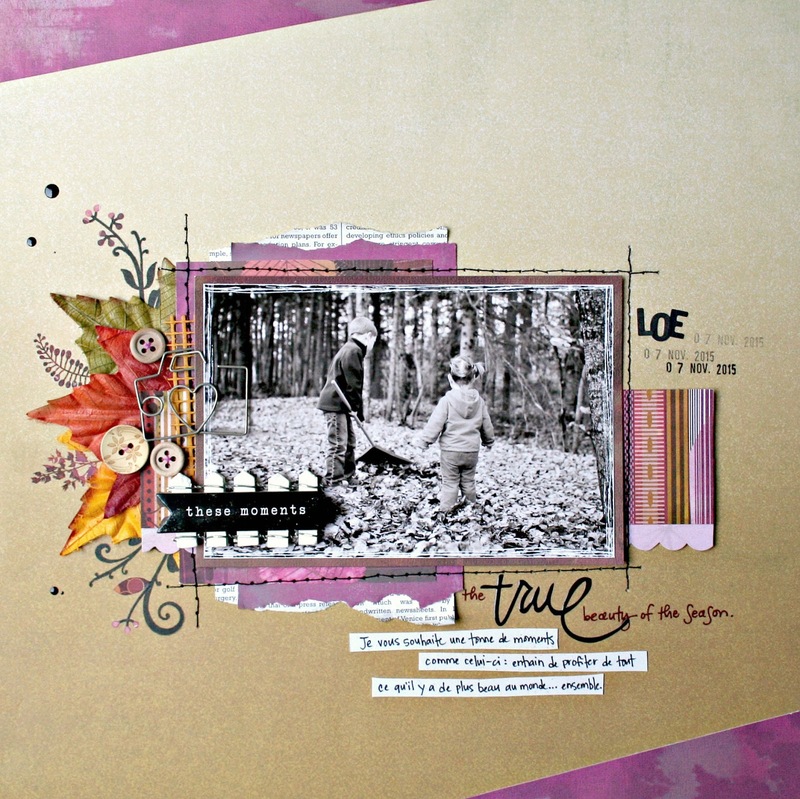 Backed by a piece of My Mind's Eye patterned paper, I layered elements from one of my all-time favourite Basic Grey collections - Indian Summer c. 2009 (patterned papers, cut pieces from the card kit, and rubons). I was also very much inspired by the white picket fence on the inspiration piece which reminded me of that fence embellishment I've been hoarding for that one special project. This layout was perfect for it! The BG leaf motives rubons embellish the three Prima leaves I stuffed under my patterned papers. For my book or dictionary paper as per this month's challenge, I used a piece of Stampin' Up book paper I've had in my stash forever. 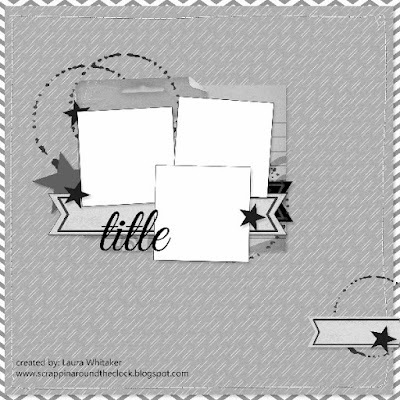 The titling is a mix of BG rubons and a Heidi Swapp title sticker. Finally, I added a Maya Road camera clip, three buttons (one is from Jillibean Soup), a Crate Paper chipboard sticker, a few basic BG alphas, three small strips of Stampin' Up cardstock for my journaling, some Tattered Angels Glimmer Glaze splats, and some good ol' stitching using a Crafter's Workshop stitching template and some DMC floss. Sketch by Laura Whitaker. Photo by Philippe Dumas. Hope you're inspired to dig through your stash and use your favorite things you've hoarding for that one special project. And if you upload your own layout inspired by this challenge over on the SOS blog, you'll get a chance to win some sweet, scrappy loot! For more information about this challenge, please hop along right over here. For the month of September, Stuck?! Sketches has so much to celebrate! 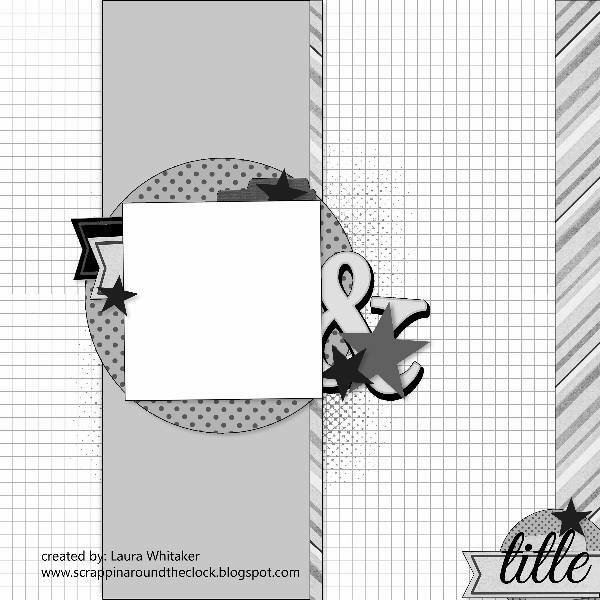 Like... 3 years of fun challenges with Laura Whitaker's sketches, the Stuck?! 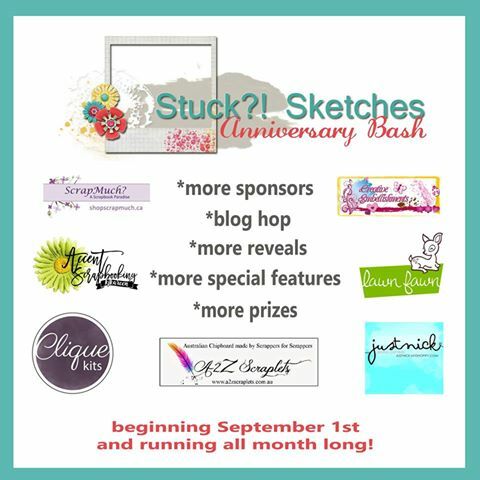 Sketches community (YOU), the joy we all share over the craft of scrapbooking, and the inspiration we gain from each other month after month! What better way is there to start commemorating our common love of creativity and storytelling than with an inspirational blog hop?! Join our design team and our sponsors, Clique Kits, as we show off our interpretations of the September 1, 2016 sketch. Stuck?! Sketches is fortunate to be able to offer extra prizes for both of our challenges this month! For the September 1st sketch, we are also thrilled to be able to offer prizes from the following sponsors, so play along with our sketch challenge for our chance to win! 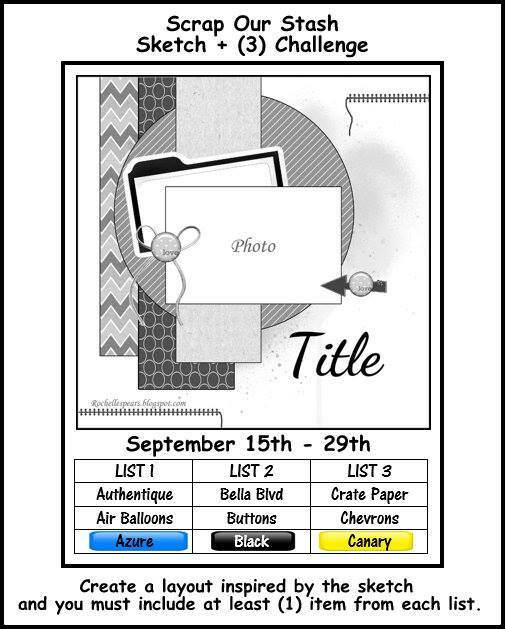 Accent Scrapbooking Prize = $50.00 gift certificate to their online store! A2Z Scraplets Prize = $25.00 Gift certificate to their online store (including shipping)! Lawn Fawn is a 6x6 paper pad and stamp set of the winners choice! AND... (insert drumroll, please)... Clique Kits is offering a prize for our hoppers specifically!! So be sure to hop to all of the links that follow and leave some love on each blog along the way. One winner will be chosen from the commenters to receive a September Clique Kits kit! 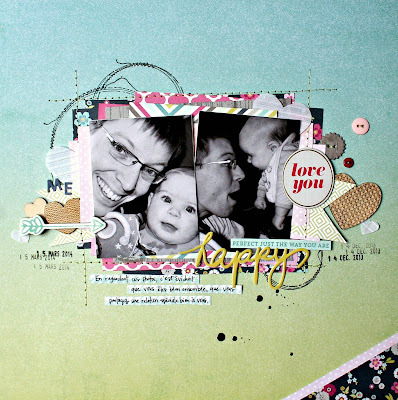 Half of our team and some of the DT from Clique Kits are supplying gorgeous inspiration for you, as you hop! Thank you to Clique Kits for sending our team members a September kit to play with! I just love this photo I took of my two kids a few years back. Éloïse had just sat by herself for the first time and Louis-Olivier was so excited to have seen her do it! Cuteness, right there! 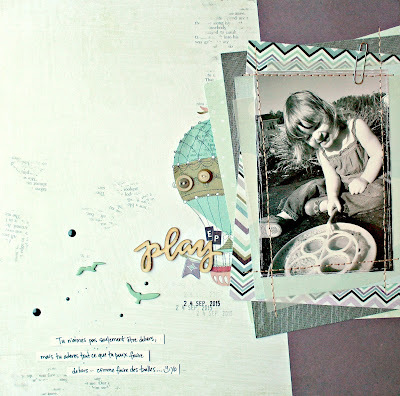 That's one of the reasons why I love scrapbooking so much - it gives me the chance to record the stories behind the photos. For this sketch, the Stuck?! 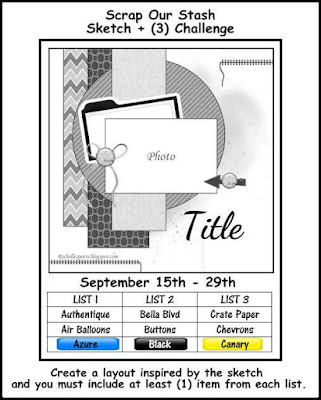 Sketches design team was given some awesome flair pieces from Accent Scrapbooking to be incorporated onto our pages. See where I put one of those I received? Yup! That's right! Between the reddish camera and the title. 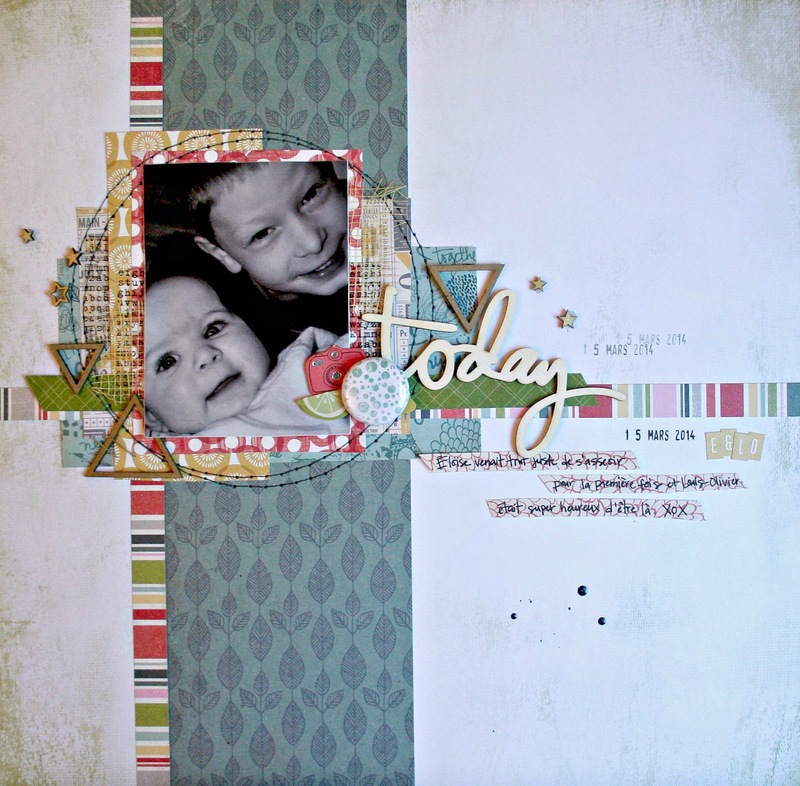 It was a perfect match for the Basic Grey Kelly Purkey's Mon ami collection I used for this layout. Set on what I believe is an old piece of My Mind's Eye patterned paper, I layered BG Mon ami patterned papers (both 12X12 and 6X6) as well as a piece of Imaginisce patterned paper. I also added some texture to the layering by stuffing in some bits of Bella Blvd transparencies and Magenta mesh in there. I grounded the layering by stitching a few circles using a Bazzill Basics stitching template with some DMC floss and then sprinkling some Studio Calico wood veneer stars with a few Creative Embellishments chipboard die-cut triangles. The title is a Heidi Swapp wood veneer piece that I jazzed up a bit using a Wink of Stella marker. Besides the Accent Scrapbooking flair, I also added a few Basic Grey Mon Ami alphas and stickers. Can't forget those Tattered Angels Glimmer Glaze paint splatters. I just love the look they create to an almost finished page. 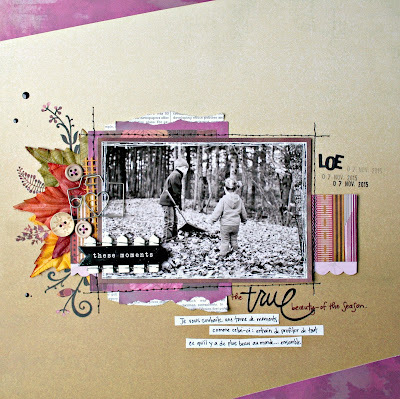 Lawn Fawn is a 6X6 paper pad and stamp set of the winner's choice!